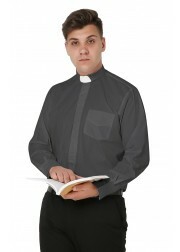 We at Ivy robes specialize in developing the finest pastor shirt for adding the charm and elegance during the sermon. These clerical shirts are worn by the religious leaders who have worked hard throughout their life to serve God. These are God’s men who offer spiritual guidance to commoners and help them in leading their lives according to the path shown by the Lord. Clergies participate in numerous religious functions where they are needed to lead certain rituals or for spreading the religious doctrines and practices. 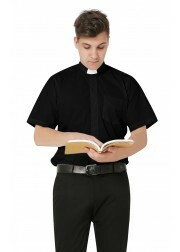 We provide the clergies with elegantly designed robes and clergy shirts(priest shirt,pastor shirts) as well as clergy collars of high quality so that they can contribute during the religious practices. Our company has a unique ability to adapt according to the needs of market. We have evolved significantly and offer a vast selection of shirts to the clergies according to their personal requirements. We also stock a vast variety of robes, church regalia, choir gowns and clergy apparel to suit the very need of our clients. It brings us a lot of happiness to state that developing an understanding of tradition and culture is a part of our work ethics which helps in the creation of best robes for the clients. Over a period of time, the church robes have undergone a series of changes according to the changing traditions and evolving style. Our experts have studied the changing trends in details and thus have developed the right piece of robes that are perfectly suited to reflect the religious spirituality. Unlike our competitors, we at Ivy robes put a lot of emphasis on the needs of our clients. We are believer of innovation and rendering top notch service to our clients according to their needs. We are glad to present the custom tailored robes and gowns to our elite clients who have been benefitting from our services since long time. 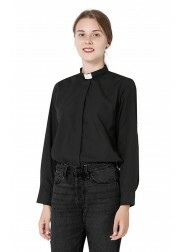 The robes and clergy shirt is created of the finest fabric. We handpick the highest quality fabric for creating fabulous shirts. The company believes in the concept of extending personalized services to clients. Ivy robes is proud of its customer care department that remains in close contact with the customers throughout the purchasing procedure. Our customer care executives will guide the clients about how to select a robe that befits the specific needs without exceeding the budget. The company offers the best quality robes and shirts to the clients at low price. 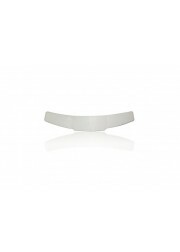 We provide our clients with the most affordable, trendy and good quality products. We provide the clients with nothing but the best that can last for many years to come. Our customers can choose a variety of finest quality regalia according to the specific requirements of their church. 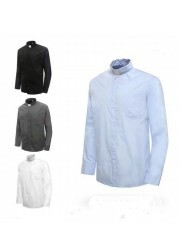 The availability of numerous options in multiple colors, styles and designs give the shirts the desired elegance. The customers can contact our customer care department by calling them at 801.853. 845. We accept Visa, MasterCard, Discover and PayPal along with other payment options.